Kevin Harvick won eight Monster Energy NASCAR Cup Series races in 2018, plus the non-points-paying NASCAR All-Star Race. And he’s hoping that success leads right into 2019. His eight race wins were a career high after winning five races each in 2006 and 2014. And for the kickoff to the new season at Daytona (Fla.) International Speedway over the next two weekends, his car will have a new look. As the Official beer of NASCAR, Busch has a long and storied history within the NASCAR family. Not only has Busch been the beverage of choice by countless winners during their celebrations in victory lane, but Busch has been along for the ride for four decades dating back to the 1979 Daytona 500. 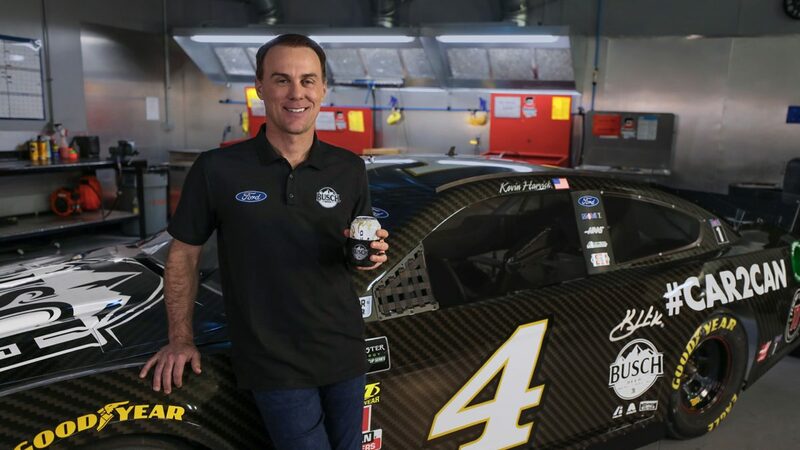 Since 2019 marks the 40th anniversary of Busch’s presence at Daytona, the brand is celebrating racing roots and raising a cold one to 40 years of NASCAR support with something never before seen in motorsport – a crisp, cold can of Busch constructed from Harvick’s No. 4 racecar. The Car 2 Can collection from Busch is giving people the unique opportunity to drink the sport they eat, sleep, and breathe. On Daytona 500 race day Feb. 17, Busch is inviting nearly 10 million Daytona 500 viewers to play a live trivia contest for a chance to win one of the exclusive cans. The truer the fan, the higher the chance folks have of winning one of the most exhilarating cans ever created. To join the race for a can during Daytona, participants will need to look out for the trivia questions on screen and simply tweet their answers using the designated hashtags #Car2Can and #BuschContest. Trivia skills not up to par? Consumers can also score a can via Busch’s charity auction ahead of the contest at Daytona. The first can of the collection will be offered to the highest bidder Monday (Feb. 11) at rallyup.com/car2can. All proceeds will go directly to Keep America Beautiful (KAB) and be matched dollar-for-dollar by Busch. KAB’s mission is to improve and beautify community environments across the country every day. As a part of Busch’s ongoing commitment to giving back to and taking care of the great outdoors, Busch partnered with KAB to kick off the collection announcement with a special auction of can #1. Follow @Buschbeer on Twitter to stay up to speed with how consumers can get their hands on a piece of NASCAR history with Busch Beer’s #Car2Can collection auction Monday (Feb. 11) and via live trivia during the Daytona 500 on Feb. 17. Meanwhile, this is Harvick’s 19th year in the NASCAR Cup Series and his sixth with crew chief Rodney Childers. Since joining forces at Stewart-Haas Racing (SHR) in 2014, Harvick and Childers have combined to produce 22 points-paying victories, a victory in the non-points-paying 2018 Monster Energy NASCAR All-Star Race at Charlotte (N.C.) Motor Speedway, 19 poles, 91 top-five finishes and 127 top-10s while leading 8,655 laps. They won the 2014 championship, finished runner-up in the 2015 title chase to champion Kyle Busch, finished eighth in 2016 and third in 2017 and 2018. The team has qualified for the Championship 4 at Homestead-Miami Speedway four times in the last five years. Harvick, driver of the No. 4 Busch Beer Car2Can Ford Mustang for SHR, has two wins at Daytona, including the 2007 Daytona 500. He also has nine top-five finishes, 14 top-10s and has led a total of 244 laps in his 35 career points-paying NASCAR Cup Series starts at Daytona. That said, he has not had a top-15 finish at Daytona in a points-paying race since he finished fourth in the 2016 Daytona 500. He does have three victories in the non-points Clash exhibition race – in 2009, 2010, 2013 – tying him for second on the all-time list with his team owner Tony Stewart and NASCAR Hall of Famer Dale Jarrett. Additionally, the Bakersfield, California native has seven top-five finishes and 10 top-10s in Clash competition. In addition to his three Clash wins at Daytona, Harvick has four other victories at the famed 2.5-mile racetrack – two NASCAR Cup Series points-paying races in February 2007 and July 2010, the 2013 non-points-paying Gander RV Duel, and the February 2007 NASCAR Xfinity Series race. The key for Harvick and the rest of the SHR team is the transition to the new Ford Mustang for this season. It is the world’s best-selling sportscar and been in continuous production since its debut in 1964. But it has never been used in the Cup Series. Harvick is hoping he can start 2019 the right way – with a second career Daytona 500 victory. He would be just the 12th driver to win the race multiple times. Talk about Car2Can for Daytona Speedweeks. Talk about the Ford Mustang. How important would it be to win a second championship in 2019? SHR’s last restrictor plate race was pretty impressive. Qualified 1, 2, 3, 4. Ran 1, 2, 3, 4 for much of that race. Can that type of performance be replicated in the Daytona 500? You won the 2007 Daytona 500. How satisfying is it to win that race?